Energy Geotechnics includes 97 technical papers presented at the 1st International Conference on Energy Geotechnics (ICEGT 2016, Kiel, Germany, 29-31 August 2016). 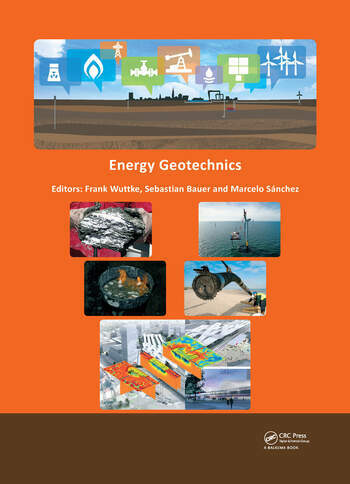 The contributions provides significant advances and critical challenges facing the areas of fundamentals, constitutive and numerical modelling, testing techniques and energy geotechnics applications. Energy Geotechnics contains seven regular sessions and six minisymposia, with contributions on discrete and continuum based modelling as well as investigations based on experimental studies at various scales. The papers on discrete and continuum based modelling examine the behaviour of gas hydrate sediments, cyclic and Themo-Hydro-Mechanical (T-H-M) modelling of energy piles, non-linear behaviour of energy geo-storage and geo-structures, deformation of geomaterials, modelling of borehole heat exchangers and energy walls, analysis of hydraulic fracturing and discontinuities in reservoirs, engineering problems involving gas hydrates sediments, and modelling of environmental impact of energy geotechnical processes. Why do nuclear engineers refuse to consider the concept of underground power plants? Underground nuclear power plants: A realistic option? Frank Wuttke is professor and head of Geomechanics and Geotechnics at the Institute of Geoscience of Kiel University since 2013. He studied civil engineering, obtained his PhD and habilitation at the Bauhaus-University Weimar, Germany. His expertise lies in the experimental developments in material design for energy geotechnic structures, the behavior of unsaturated soils, developments in soil-structure-interaction, process monitoring methods and material identification. His working field includes dynamic material behavior, wave propagation and dynamic soil-structure interaction. Currently, he actively works in the developments of energy geostorage systems and numerical simulation of microstructure based coupled thermo-hydro-mechanical behavior of geomaterials including fracture modeling. He is member of different national and international task forces in geotechnical and energy-geotechnical fields. Sebastian Bauer is professor and leader of the Geohydromodelling group at the Institute of Geosciences of Kiel University (Germany) since 2007. He studied Physics and obtained his PhD and habilitation in Geosciences at the Centre of Applied Geosciences, Tuebingen University (Germany). His expertise is the analysis and numerical simulation of coupled non-isothermal multiphase fluid flow and reactive transport processes in subsurface porous media. Application areas include reactive transport at contaminated groundwater sites, heat and energy storage in the subsurface, shallow and middle deep geothermal use, geological CO2 sequestration, nuclear waste storage and karst genesis simulations. His special interest is the coupled phenomena encountered in these subsurface application areas and their representation in numerical codes and applications. He has coordinated large joint research projects and is currently coordinator of the ANGUS project on subsurface energy storage. Marcelo Sánchez was appointed as an associated professor in the Zachry Department of Civil Engineering TAMU in September 2009. He obtained his first degree in Civil Engineering from the Universidad Nacional de San Juan (Argentina). His Master and Ph.D. (2004) degrees are from the Universidad Politecnica de Catalunya (UPC, Barcelona, Spain). His expertise lies in the analysis of Thermo-Hydro-Mechanical and Chemical (THMC) coupled problems in geological media. The main applications of his research are related to the design of nuclear waste disposal, the study of gas production from hydrate bearing sediments, the behavior of unsaturated soils and expansive clays, design of energy piles, the behavior of frozen soils, and the design of underground compressed air storage system. He has published more than 100 peer review papers. He is acting as an Associated Editor of five International journals, and is one of the recipients of the "George Stephenson Medal 2012" (ICE, UK), and other awards. He is the Chairman of the ISSMGE Technical Committee TC308 on "Energy Geotechnics".